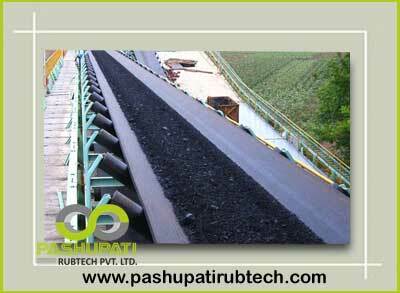 We manufacture premium quality Flame Resistant Conveyor Belt which is used frequently for various industrial purposes. This conveyor belt is made from ethylene vinyl acetate rubber and aluminum hydroxide that act as a fire-proofing agent. Little quantity of stearyl amine is also added to ensure maximum resistance to fire, high durability & tensile strength, resistivity to undesirable conditions, good trough ability and elasticity. Manufactured assortment of this flame resistant conveyor system is required for various purposes and moving inside the construction sites, burrows and mine where safety is of vital significance. Provided range is appropriate to avoid flame hazard in coal mines and condense the continuation of conveyors, which are horizontal to be damaged by flame at the blast furnaces of iron works. Moreover, our highly experienced engineers manufacture this conveyor system as per the given specification by our clients that meets international standards. In order to guarantee the flame retardant properties, manufactured assortment of this conveyor belt undergoes various tests according to ISO standards. To achieve ISO Mark our belt is tested on several parameters include drum friction test, flame test, electrical resistance test etc. Offered Flame Resistant Conveyor Belt is highly acknowledged among our all national and international clients due to their standard characteristics like flame-resistant finish, capability to deliver superior performance under extreme temperatures, excellent low temperature flexibility, and static conductive.